Ideal condensate drainage and recovery under all operational conditions. The condensate pump is specially designed to pump high temperature condensate directly into the boiler. Through this re-use of hot condensate, fuel consumption to generate steam can be significantly reduced, often around 10-15%. 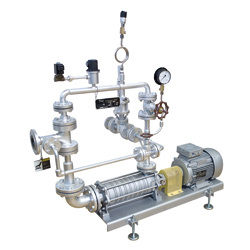 This system uses a side-channel pump combined with an ejector. The jet pump ensures that even with minimum filling head (min. 1m), high temperature condensate can be pumped without the risk of cavitation. It is not necessary to have a high-pressure condensate tank with level control in front of the CP-N. A small condensate header with a surplus valve is sufficient. We consult. Personally, with knowledge. For more information on TLV System Products, or to enquire about a system solution for your workplace, please contact us. Products engineered by TLV Euro Engineering UK.